Hospice use is growing, but transition often happens late. Social workers are key in encouraging difficult but important discussions among families and treatment providers that can help them make better palliative care decisions. It’s an all too familiar story. Michael is diagnosed with stage 4 cancer. His physician admits that she can’t cure the disease but can offer aggressive treatment that might prolong Michael’s life. She may do so because she believes in the medical arsenal, the family or patient demands it, or she may not have the training in end-of-life care or the communication skills to cope with Michael’s response to his diagnosis or to attend to his deeper needs. The health care team doesn’t discuss hospice because to do so might be admitting defeat or deflate the spirits of all involved. Michael’s wife and children are grateful there’s something that can be done and they encourage him to fight for his life, lovingly pledging to support him in the battle. Like his physician, they may not believe that treatment will prolong his life, but it’s all they have to cling to or it’s how they hope to shield him—or themselves—from absorbing the truth. They’re either unfamiliar with hospice care or they reject that option. They’ll prefer not to acknowledge, at least in Michael’s presence, the terminal nature of his illness. A common end to this story is that Michael will search for hope in the physician’s treatment plan and take up his family’s rallying battle cry for one of many reasons. The simplest is that, like all humans, he’s programmed to survive. The others are more complicated. Michael may endure the treatments offered, despite their harsh side effects and the toll they take on what quality of life remains, in the hopes that there will be more and better life afterward. Even if he doesn’t have faith in the medical team’s apparent optimism, he may consent to treatment because he doesn’t wish to disappoint his family by failing to fight the good fight. Or he’ll agree simply because no one has explained his medical condition; described the full range of options, including hospice; or asked how he feels or what he wants. Regardless of the reason, treatment will continue until Michael’s impending death can no longer be ignored, when he will be transferred, perhaps semiconscious, to hospice care only days before dying—his psychological and spiritual needs never having been addressed. Some would describe this as a vignette about denial on the part of physicians, family members, and patients themselves. Others reject the term “denial” and suggest that this scenario is better discussed as the consequence of an inability to communicate. The result—a failure to face the terminal nature of an illness—often robs patients and family members of all but the briefest experience of hospice, leaving too little time for them to gain the care and comfort hospice is designed to provide and denying them the dignity to make their own informed choices. Gerontologist Joan M. Teno, MD, MS, and other researchers at Brown University’s Warren Alpert School of Medicine reviewed random samples of Medicare claims data from the last 180 days of the lives of 800,000 adults aged 66 and older who died in 2000, 2005, and 2009. While their findings, published earlier this year in The Journal of the American Medical Association, reveal an increase in hospice use, they also indicate that patients entered hospice much later, often in the last three days of life, and after an increasing number of intensive care stays and multiple hospitalizations. When treatment endures with little hope of curing the illness, patients’ quality of life may be diminished as their lives are prolonged, says Ann Callahan, PhD, LCSW, an associate professor in the department of social work at Middle Tennessee State University. “This reduces the duration of palliative services that could have minimized suffering associated with aggressive treatment.” Not only may patients abide unnecessary pain, fatigue, hospitalizations, and procedures, but without access to hospice services, “these individuals and their family members may not be as prepared for death as they could otherwise have been,” Callahan notes. 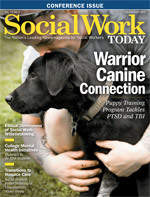 She adds that spirituality and social support reduce death anxiety, “and the social worker can work to promote these factors of resiliency.” Patients who don’t receive hospice care or who come to it too late may have been left to struggle on their own with overwhelming anxiety and existential dread throughout the course of treatment. “There are many reasons that can lead to a delay or failure to offer hospice care,” Callahan says. Among these factors are restrictive hospital requirements, insurance eligibility issues, hospice admission criteria, the medical staff’s ability to provide prognoses, and cultural attitudes toward hospice care—all of which social workers may be able to help overcome. However, experts suggest the persistence of hope beyond its true usefulness to the patient is the more common reason and the more difficult—though certainly not impossible—to address. Social workers and hospice staff point to the preference by physicians, patients, and family members for so-called curative treatment when a cure should not be a chief factor in the decision not to choose hospice care. Sometimes the silence on these issues begins with medical professionals. Many are not trained in end-of-life issues and find it difficult to speak to patients about dying or they sense a patient’s reluctance to engage in a conversation about death. As a result, they offer instead some hope that treatment may allow the patient to live longer. Patients and families pay a price when, in discussions, everything isn’t on the table or they aren’t invited to have a voice. There is a cost to silence: the lost opportunities to speak truthfully from the heart and make real, informed decisions based on information they can understand. While social workers may approve of hospice care, they must act on their patients’ desires. Yet patients often don’t have adequate information on which to base decisions. “If social workers don’t have a conversation with the patient about the options and their possible benefit, there is no way to know what the patients really want. They may suffer through aggressive care they may not even want but are enduring either because it was offered or for the sake of their family,” Reese says. “They definitely need a social worker to facilitate this conversation. It’s equally important that the conversation be ongoing. “People often jump into aggressive treatment, and there are no established ground rules for checking in at regular intervals to see if the game plan needs to be changed,” Janssen explains. “We get stuck in the momentum of our actions and initial choices. The patient who was eager for that first round may inwardly have doubts about the second round, but no one asks, ‘Do you still want to go this route?’” It’s often assumed, he adds, “that patients will want today what they wanted yesterday. But when the care plan becomes rigid and fixed, choice is imperiled and people are pressured to stay fixed in an aggressive course to the bitter end.” The narrative, he insists, needs to stay fluid and allow the patient to make new choices as events unfold. “Once it becomes clear that treatment won’t prolong life, patients and their families must face the hard questions about what happens during and after death. The processing of such profound information has to occur within the context of a larger death-denying culture and as an affront to human nature that propels us to cling to survival,” Callahan says. “It’s often very important for the patient to be able to talk with family members about issues important to them in order to die peacefully. These may include resolving conflicts, seeking forgiveness, forgiving family members, saying thank you, discussing spiritual beliefs and concerns, or just seeking emotional support with anxiety and anticipatory grief,” Reese says. She says it’s important to “respond with honesty and compassion about the patient’s condition as well as ensure the patient understands what they are being told about the terminality of their disease.” The information “must be specific to what the patient wants to know, sensitive to the patient’s ability to process the information, and involve collaboration with others,” she explains. “I’ve come to believe there is no real right or wrong for patients and families,” Janssen concludes. For all his years of experience, he shares with social work interns the only two assumptions he makes about this work. “No matter what it looks like to us, our patients and their families are doing their best. It’s not our job to judge or push an agenda.” The social worker’s task is to understand how patients and family members’ choices make sense for them, support an honest conversation about how they want to spend the rest of the days or weeks remaining, and help them move in that direction, he says.